Can I print the images on my flipping catalog? As a catalog, there must be many product pictures. Sometimes we would like to print the favorite image out as reference for future purchase. Flip Shopping Book Maker allows you to print any area on any flipping pages. This feature will lead to an improvement of UE (User Experience). What a great design! 1 Start Flip ShoppingBook Maker, and then click on the button of Edit Shopping Cart. 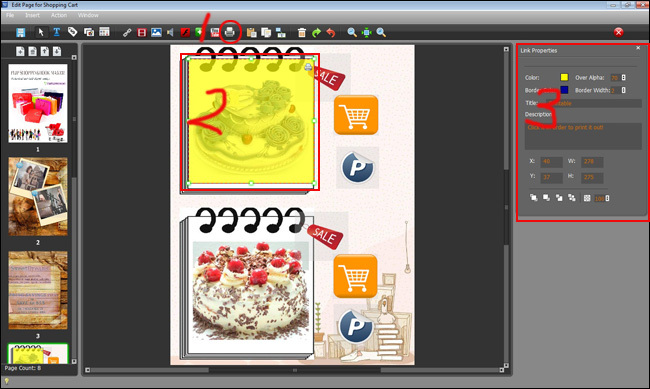 2 Find out the button of Add Printable Area, click it and draw an area on any page. 3 Enter some words in the forms of Title and Description.